Inspired by the legendary ZENITH aviation watches of yesteryear, in 2018 the brand with a star adds a new dimension to its iconic Pilot Collection with a 40mm case in glowing bronze. 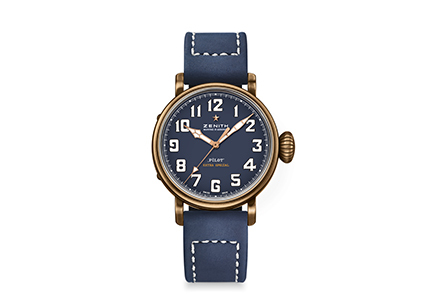 Featuring the broad fluted crown, oversized luminescent numerals, and the in-house automatic ‘engine’ of its predecessors, the latest in the line-up is magnificently offset by a choice of matte blue or black dials with matching blue or eminently military khaki green oily nubuck straps and contrasting stitching. In 2018 ZENITH’s famous PILOT TYPE 20 EXTRA SPECIAL 40 mm goes for bronze – vintage style, once again combining its imposing yet manageable 40mm presence and ideal proportions with a choice of elegant hues. Embodying all the attributes inherited from aviation’s pioneering days, and with its format suited to every wrist, this latest iteration of the PILOT TYPE 20 EXTRA SPECIAL 40 mm rounds out an already emblematic range from ZENITH, thus far composed of large-size watches. Hailing from an all-conquering lineage, this distinctive model featuring more ‘democratic’ 21st century dimensions continues to house the same original attributes: an in-house movement, a broad fluted crown and large luminescent Arabic numerals swept over by finely crafted hands. While never losing sight of the spirit of adventure that forged its legend, this distinctive and classy watch lends itself to the most stylish vintage variations, setting the seal on its trendy neo-retro bronze look with matte black or blue-finish dials and oily nubuck straps in either khaki green or blue. Both feature protective rubber lining for optimum comfort and a titanium pin buckle. Optimal legibility is ensured by an aeronautically inspired font composed of white Super-LumiNova® blocks, along with white luminescent facetted hands to ensure daylight vision even at the darkest hour. At the heart of the PILOT TYPE 20 EXTRA SPECIAL 40 mm beats the automatic Zenith Elite 679 calibre. This reliable and accurate in-house movement drives central hours, minutes and seconds hands, while delivering a 50-hour power reserve. 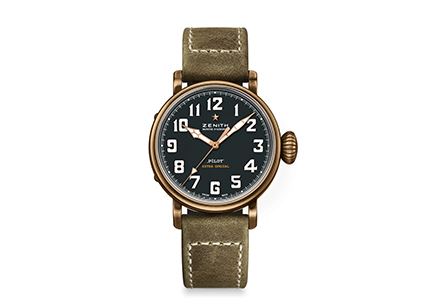 In a nod to the history of the Maison, the solid bronze case-back depicts the plane flown by Louis Blériot when he crossed the Channel in 1909 with a ZENITH on his wrist, along with the ZENITH flight instruments logo, complemented by a motif inspired by the fuselage of the legendary French pilot’s aircraft.